Hope Studios in Manchester is closing, so we needed to find a new home by the end of January 2019. It’s been quite a search, but we’re absolutely thrilled with our new venue. 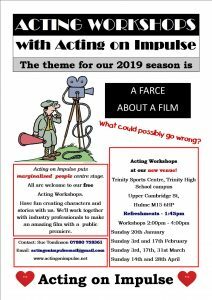 From Sunday 20th January we’ll be holding our workshops in the Dance Studio at Trinity Sports Centre. It’s in the grounds of Trinity High School, Hulme, Upper Cambridge St, M14 6HP. It’s a spacious studio and we will be serving refreshments in a meeting room nearby. The staff have been so welcoming, friendly and supportive of what we do, we can’t wait to start. During this term, the themes and characters that have been developed so far will be pulled together into a script. Filming will take place April/May and the premiere will be in July. The genre is farce. A company of actors stage a coup and take the filming over from the professional crew. What could possibly go wrong? We have a solid company of actors, an average of 20 have turned up to all sessions so far. Dan Johnson from Hope Studios has been directing the workshops, with great results. We encourage you to sign in via Twitter to prevent anonymity of comments, but if you would prefer to comment as a guest, you can do so below. Benjamin Morris was brilliant as the archivist. Thanks Jeff it was great to hear from you. What a brilliant performance Ben Morris as the archivist top actor love him loads. Thanks again Theresa. God Bless You it is so rewarding to create a character alongside Jeff Hordley in a Capital Theatre Production. Ben Morris was the best Iago I have ever seen in Manchester. God Bless you Domino.